Looking for a buttery crisp skin for your baked turkey? Here’s a flavorful herbed butter recipe that will create a wonderful finish to your baked turkey every time. Before preparing your herbed butter, make sure your butter has been pulled from the fridge to reach room temperature. Then, combine the ingredients until mixed well. That’s all there is to the mixture. Gently loosen the skin from the breast of the turkey using your fingers or a silicon spatula. Then, add the herbed butter by the spoonful between the skin and the meat of the turkey and rub to spread evenly throughout. 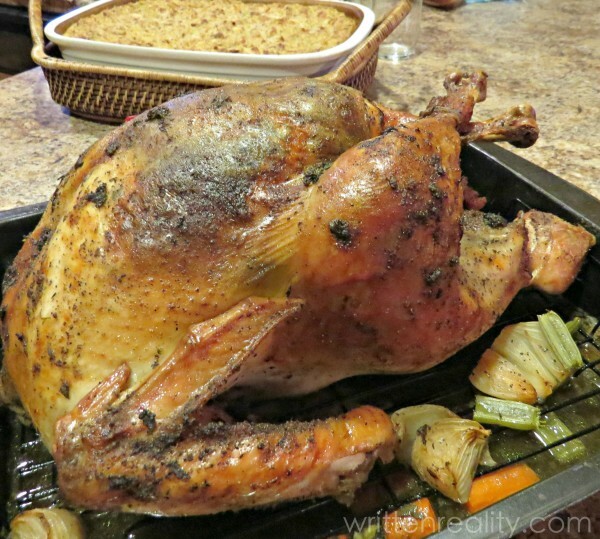 Use the rest of the herbed butter on the outside of the turkey and spread all over. Check out the rest of the How To Bake A Turkey recipe here, for the best turkey ever.